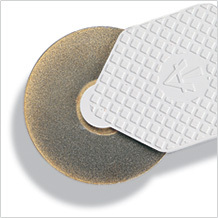 A Disc held with finger and thumb , great for tight contacts and very useful in Orthodontics also. Sold in Pack of 2 Discs. Very Useful, and held between Thumb and fore finger, for contact opening etc .